This week’s brief entry (it is short because we’re in the first few days of a new semester at Wooster) is related to last week’s post. Above are two gastropod opercula from the Nicosia Formation (Pliocene) of Cyprus. They were collected on a Keck Geology Consortium expedition to Cyprus in the summer of 1996 with Steve Dornbos (’97). An operculum for a gastropod is a kind of hard door attached to the muscular foot that closes off the aperture when the snail is fully retracted into its shell. 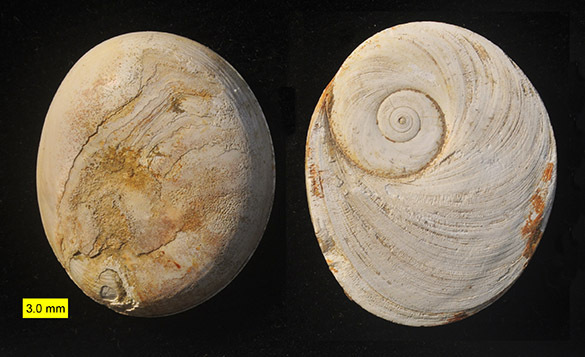 On the left is the inside of an operculum, and on the right is the elegantly spiraled outside. The operculum provides protection for the snail from both drying out during a low tide and from prying (literally!) predators. We can’t tell for certain, but we think these opercula are from the herbivorous gastropod Astraea rugosa featured in last week’s entry. We found them at our fossil coral reef site in the same deposit as the A. rugosa shells. They also look very much like these modern A. rugosa opercula. Checa, A.G. and Jiménez-Jiménez, A.P. 1998. 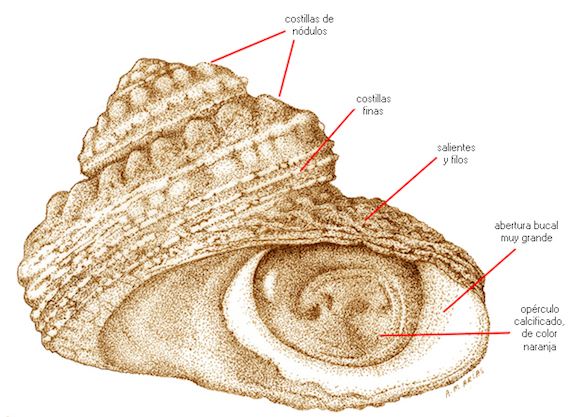 Constructional morphology, origin, and evolution of the gastropod operculum. Paleobiology 24: 109-132.